Yay for Hollywood big-budget flicks! Director Shekhar Kapur helms this project, and he does seem to know his way around merry old England, being the director of the two Elizabeth films (which starred the beautiful Cate Blanchett). Well, there's a lot you can do with a huge budget. Kate Hudson doesn't seem to shine at all in this film. Again, probably because this is a guy film, and she's the only woman in it. 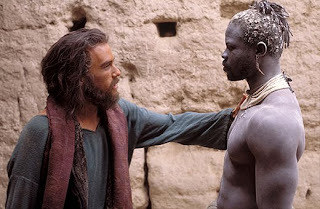 Djimon Hounsou by this time was already Hollywood's go-to guy for roles involving huge African slaves. Talk about stereotypes and racism. Heath Ledger, on the other hand, stands out. Not because he was Hollywood's new poster boy during this time. Ledger's performance is so subtle that he doesn't even try to steal scenes, despite being the sole lead actor in this movie (you'll forget everybody else's names). This film is about cowardice, and it's cowardice that Ledger shows in his eyes and his facial twitches. Absolutely brilliant. And although the beard made this look like a Biblical film, I'm sure he grew it for thespic purposes. These method actors are damn brilliant. So, you can either watch this film for two things: exciting war scenes, with the British army fighting it out in the deserts of the Sudan; or Heath Ledger's brilliant performance. Or both. The Four Feathers. USA. 2002.